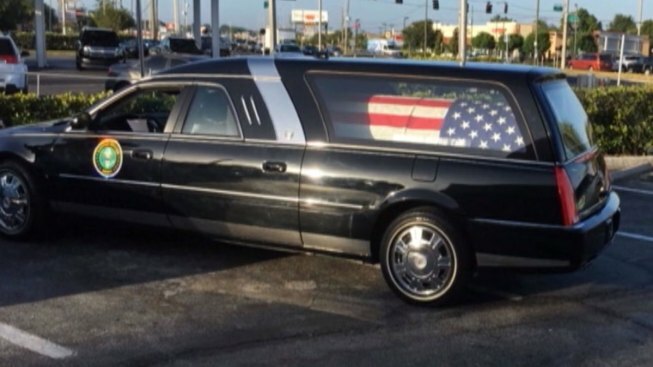 Two former funeral home employees are out of a job after they stopped for coffee at a Dunkin' Donuts, leaving a hearse carrying the flag-draped coffin of an Army veteran in the parking lot. NBC affiliate WFLA reports that the body of Lt. Col. Jesse Coleman was on its way from Veterans Funeral Care in Clearwater to a funeral service Tuesday morning. The two employees stopped at a Dunkin' Donuts in New Port Richey around 8:50 a.m. Rob Carpenter, who was headed into the Dunkin' Donuts that morning, did a double take when he saw the hearse. Carpenter's own father served in the military, so he decided to confront the drivers. "I'm like, 'Is this really a body in here?' and he says, 'Yes,' and I said, 'So you have a dead soldier in the back of your hearse and you're stopping to get coffee?' And he didn't say anything," WFLA reports. Carpenter decided to pull out his cell phone and take a video and photos of the hearse. He passed them along to local group, Veteran's Warriors. Lauren Price, the head of Veteran Warriors, posted the photo on Facebook and it went viral. "None of our brothers or sisters deserve to be an afterthought," Price told WFLA. "And if it's an imposition to transfer one of our brothers or sisters to their final rest, then the person who's doing that transporting should be in a different business." Funeral home director Jim Rudolph said the employees were in violation of strict company protocol which dictates that drivers take the body straight from the funeral home to the service with no stops. Rudolph said that only in the case of an emergency, which this was not, one of the drivers must remain with the body, and the curtains must be closed in the back to conceal the coffin from outside viewers. He told WFLA that the men are brothers in their 70's who have worked for the funeral home for several years with stellar employee history. He adds that the men are actually sons of veterans themselves. Rudolph said he considered suspending the long time employees, but ultimately decided it was necessary to terminate them both. He said both men were "heartbroken." "They were good employees and didn't want to go out like this," Rudolph said. "In this business, you can't have a redo, if you tarnish someone's memory." He says Coleman's family, however, was surprisingly forgiving and didn't want the men to lose their jobs, even praising their work at the funeral. The family says Coleman, who died at age 84, served one tour in Korea, two in Vietnam, and was the recipient of numerous medals from the military, including two Bronze Star Medals and two Army Commendation Medals. Plans have been made to bury Coleman at Arlington National Cemetery in Virginia.